Hey, can u guys help me see if my WP horse is troping or loping? Definitely not a trot, it lacks the impulsion for a nice two beat trot. Not a lope either, so to avoid making this a habit either squeeze her up into a nice 1-2-3 canter or bring her back to a walk and ask for a good and proper trot. Definitely it is the kind of gait which makes outsiders say "what is with that WP stuff? They don't seem to want their horses to go anywhere." horseylover1_1, AnitaAnne, Dustbunny and 3 others like this. Thank you guys! He’s 4 beating right? That inbetween gait, and how can I tell when he’s properly loping? and how can I tell when he’s properly loping? When you get a moment of suspension. He is moving like my navicular horse. The jog looks miserable for him and the lope is closer to a trope. He's trying to lope in the front but trotting in the back. Yucky :( Looks like a very sweet horse though. Kalraii, rambo99 and JoBlueQuarter like this. When you're going to the right it's... a lope, though barely a lope, but that seems desirable in WP these days?? To the left s/he never quite gets there. Just does a little head bob like s/he's thinking about doing it but never actually gets out of jog. One of the horses where I ride learned that she could fake out kids and avoid actually cantering if she just bobbed her head in a canter-like way while continuing to trot. This horse looks a little like when you're going to the left. AnitaAnne, Kalraii and JoBlueQuarter like this. To add to what I just wrote above, look at the legs when you're going to the right: they're landing in the correct order for lope. Three beats: hind left first, then hind right and front left at the same time, then front right. 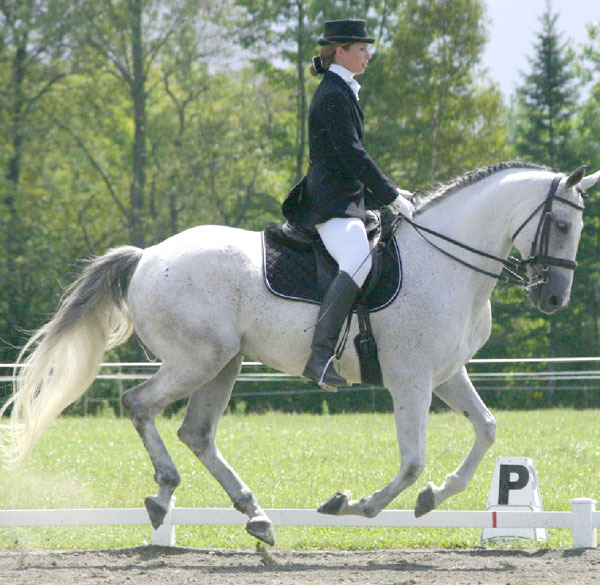 Now look at your horse's feet when he's going to the left: despite the head motion, he's just doing the two-beat steps of the jog/trot. Hind left and front right together, then hind right and front left together. For lope that direction, it *should* be the three beats as above, but with: hind right first, then hind left and front right together, then front left. I agree with @SteadyOn . . . going right there were moments of true loping. there were also bits of troping. Going left, you never had a true lope. Almost all of the 'trot' , or jog as it's called, was so flat that it was really some kind of a four beat walk. Really pretty horse. His tail swishing seemed to indicate displeasure, tho. Thank you guys this helps a lot! I’ll keep working with him to get out of his troping, he has no soundness issues just trained to go too slow.